This column is a continuation from last week, Frequently Asked Questions of the American Disability Act, pertaining to Service Animals. It is reprinted here as a service to readers of the Gallup Sun who may have become confused over the issue in recent weeks. We hope this clarifies the matter for them. 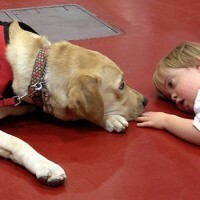 For more information on Service Animals that may not have been included in this column, please log on the website at www.ada.gov or call 800-514-0301 (Voice) and 800-514-0383 (TTY), M-W, F 9:30 a.m. – 5:30 p.m. , Th 12:30 p.m. – 5:30 p.m. (Eastern Time) to speak with an ADA Specialist. Calls are confidential. A. In most settings, the presence of a service animal will not result in a fundamental alteration. However, there are some exceptions. For example, at a boarding school, service animals could be restricted from a specific area of a dormitory reserved specifically for students with allergies to dog dander. At a zoo, service animals can be restricted from areas where the animals on display are the natural prey or natural predators of dogs, where the presence of a dog would be disruptive, causing the displayed animals to behave aggressively or become agitated. A. 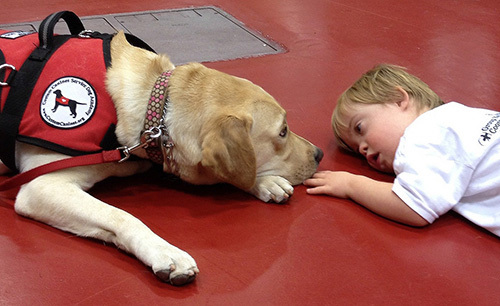 The ADA requires that service animals be under the control of the handler at all times. In most instances, the handler will be the individual with a disability or a third party who accompanies the individual with a disability. The service animal must be harnessed, leashed, or tethered while in public places unless these devices interfere with the service animal’s work or the person’s disability prevents use of these devices. In that case, the person must use voice, signal, or other effective means to maintain control of the animal. Under control also means that a service animal should not be allowed to bark repeatedly in a lecture hall, theater, library, or other quiet place. However, if a dog barks just once, or barks because someone has provoked it, this would not mean that the dog is out of control. A. Generally, the dog must stay on the floor, or the person must carry the dog. For example, if a person with diabetes has a glucose alert dog, he may carry the dog in a chest pack so it can be close to his face to allow the dog to smell his breath to alert him of a change in glucose levels. Are restaurants, bars, and other places that serve food or drink required to allow service animals to be seated on chairs or allow the animal to be fed at the table? Are gyms, fitness centers, hotels, or municipalities that have swimming pools required to allow a service animal in the pool with its handler? A. No. However, service animals must be allowed on the pool deck and in other areas where the public is allowed to go. Are churches, temples, synagogues, mosques, and other places of worship required to allow individuals to bring their service animals into the facility? A. No. Religious institutions and organizations are specifically exempt from the ADA. Do apartments, mobile home parks, and other residential properties have to comply with the ADA? A. The ADA applies to housing programs administered by state and local governments, such as public housing authorities, and by places of public accommodation, such as public and private universities. In addition, the Fair Housing Act applies to virtually all types of housing, both public and privately-owned, including housing covered by the ADA. Under the Fair Housing Act, housing providers are obligated to permit, as a reasonable accommodation, the use of animals that work, provide assistance, or perform tasks that benefit persons with a disabilities, or provide emotional support to alleviate a symptom or effect of a disability. Do Federal agencies, such as the U.S. Department of Veterans Affairs, have to comply with the ADA?